With the Christmas extrava­ganza now a distant memory, churches are busily gearing up for their next big obser­vance—the celebration of the Savior’s death and resurrection. As with Christmas, Easter is an­other major celebration featuring an odd blend of religious, mythical, and profane themes: chalices and chocolate, crosses and croissants; bonnets and bunnies, hymns and hams; Son worship and sun worship. The unstudied may think it pe­culiar that Yahweh would require His people today to eat unleavened bread for a week following the Pass­over. Yet they find nothing weird about observing the Savior’s resur­rection by searching church lawns for painted eggs … allegedly laid by rabbits! 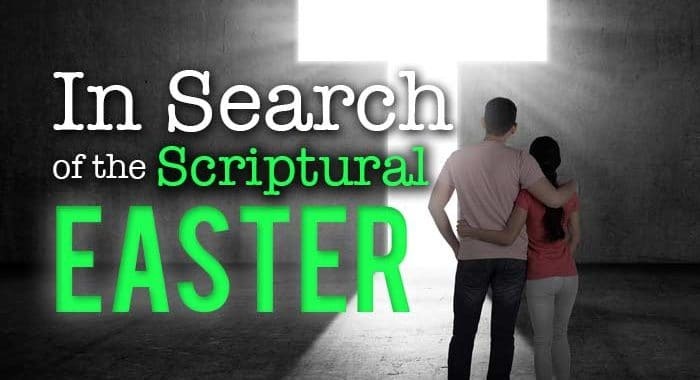 It is time to conduct our own search­ for the scriptural Easter to see whether there even is one. One Verse in a Version – Proof of Scriptural Easter? “ … intending to bring him before the people after Passover,” The New King James Bible. “ .. .intending, after the pasch, to bring him forth to the people,” Douay­-Rheims (Catholic). In this last version, “pasch” is simply the near Greek word for the Hebrew Pass­over, Pascha. “Passover” is found 28 times in the King James New Testa­ment, Easter only once. Clearly a translation anomaly exists with the KJV. The idea of a “Scriptual Easter” is simply not true. As the King James Newberry Refer­ence Bible shows in a side column note on Acts 12:4, the word “Easter” in the King James should have been “Passover” (Newberry includes the Greek letters for “Pascha”). Amazing, isn’t it? Easter is the second biggest religious celebration of the Bible-professing world, yet, its only scriptural evidence is one erroneously translated word! But that’s not all. You don’t have to hunt long to discover that no one in the Scriptures ever observed Easter. Rather, even in the New Testament the Apostolic Assembly continued with the Bibli­cal Holy Days commanded in Exo­dus 12 and Leviticus 23. Our Savior died at Passover as the ultimate Passover sacrifice, a fact the Apostle Paul clearly explains in lCorinthians 5:7. The Eleventh Edition of the Encyclopaedia Britannica confirms this simple and astounding fact, “There is no indication of the obser­vances of the Easter festival in the New Testament or in the writings of the apostolic Fathers … The first Chris­tians continued to observe the Jewish festivals, though in a new spirit, as commemorations of events which those festivals had foreshadowed” (“Easter,” vol. 8. p. 828). The commanded Old Testament Feast days were the ONLY annual observances that the early New Testament Assembly recognized. This fact should speak volumes to every Bible-believer today about the importance of honoring those same observances commanded to Israel. Theologians cite Acts 2 as the start of the New Testament Assem­bly. But they neglect the reason that the Apostles and disciples were gath­ered that day. It was in observance of the command in Leviticus 23 to keep the Feast of Weeks (Pentecost)—one of the seven annual holy days! Nowhere can we find a Biblical injunction to observe the Savior’s res­urrection as a special holiday. The command was and always will be to keep the memorial of His death at Passover. This being the case, where did “Easter” originate? Yahshua told His disciples that the poor we would always have with us. The same thing can be said of hea­then worship, at least until Yahweh’s righteous Kingdom is established on earth. The link between Easter and pa­ganism is so obvious no one could miss it. For starters, take the name. “Easter” even sounds like its name­sake—Eastre, the Saxon deity of dawn, spring, and fertility. One au­thority notes, “Easter is a word of Saxon origin and imparts a goddess of the Saxons, or rather, of the East, Estera, in honor of whom sacrifices being annually offered about the Pass­over time of the year (spring), the name became attached by association of ideas to the Christian festival of the resurrection, which happened at the time of the Passover,” Cyclope­dia of Biblical, Theological, and Eccle­siastical Literature, “Easter,” p. 12. In his Dictionary of Word Origins” Joseph Shipley writes, “Easter. This is from Anglo Saxon Eostre, a pagan goddess whose festival came at the spring equinox. The festival was called Eastron(plural of Eastre). The Christian festival of the resurrection of [Messiah] has in most European languages taken the name of the Jew­ish Passover (Fr. Paques, It. Pasqua, from Latin pascha … ); but in English the pagan word has remained for the Christian festival,” p. 131. Before she.was Eastre, the idol was called Ishtar (pronounced by the Assyrians and Babylonians as we do Easter). John in Revelation tells us that Babylon is the mother of all false worship, and Revelation 14:8 says that Babylon caused all nations to partake in her spiritual unfaithfulness. Our society didn’t escape Babylon’s influence regarding the Easter observance, ei­ther. Ishtar (a.k.a. Semiramis) was the wife of Nimrod, the priest-king and founder of Babylon. She was the first “deified woman” (Alexander Hislop, ­The Two Babylons, p. 304). The Greeks worshiped her as Aphrodite and the Romans as Venus, goddess of love. “The children gather wood, and the fathers kindle the fire, and the women knead [their] dough, to make cakes to the queen of heaven, and to pour out drink offerings unto other mighty ones, that they may provoke me to anger” (Jer. 7:18). “Cakes” is the Hebrew kavvan, meaning a sacrificial cake, which was “used in worship of Ishtar,” The New Brown, Driver, and Briggs Hebrew and English Lexicon, p. 467. These “cakes” survive as today’s hot cross buns—an Easter tradition on which are marked crosses, the symbol for woman. In hieroglyphics the cross is a symbol for life. This ancient queen of heaven was the mother of life, the heathen believed. Also prominent in the Easter cel­ebration is the egg. The 1994 winter Olympics opened with a ceremony featuring a huge egg, ancient pagan symbol of life. Mithras, the sun god, supposedly hatched from a cosmic egg. Pagan mythology says a mystic egg of the Babylonians fell from heaven into the River Euphrates. Once fish had pushed it ashore it hatched and out came Astarte—Eas­ter (Venus). Hence, the egg became a symbol of Astarte or Easter (The Two Babylons, p. 109). The egg soon figured into Chris­tian Easter worship. According to Hislop, “A form of prayer was even appointed to be used in connection with it, Pope Paul V teaching his superstitious votaries thus to pray at Easter—‘Bless, O L-rd, we beseech thee, this thy creature of eggs, that it may become a wholesome suste­nance into thy servants, eating it in remembrance of our L-rd J-sus Chr-st,’” p. 110. Imagine honoring Abraham Lincoln with Bingo parties. Or celebrating the first moon walk with a fishing derby. It makes as litte sense to observe the resurrection of the Savior with choco­late rabbits that lay colored eggs. Tradition has melded two entirely dif­ferent observances, intermixed them to produce the strangest of crossbreeds—not unlike remember­ing the Savior’s birth with Santa Claus, reindeer, and evergreen trees. To understand why the rabbits, we need to go back again to a more ancient festival that in the apostate church merged with Passover to be­come the Easter hybrid. “Although Easter is a Christian festival, it embodies traditions of an ancient time antedating the rise of Christianity,” says Funk and Wagnalls Standard Reference Encyclopedia. This source goes on to describe Eastre, the Teutonic goddess of spring and fertil­ity, to whom was dedicated “Eastre monath,” corresponding to April. “Her festival was celebrated on the day of the vernal equinox, and traditions associated with the festival survive in the familiar Easter bunny, symbol of the fertile rabbit, and in the equally familiar colored Easter eggs originally painted with gay hues to represent the sunlight of spring” (“Easter,” Ibid, p. 2940). In its effort to join heathen with Bible believer, the early church ac­commodated many pagan obser­vances, finding common dates on which to merge. Easter and Passover is one example. Try as they could, however, they could not detach the pagan dates from the pagan rites and rituals. “Then said he unto me, Have you seen this, O son of man? turn yet again, and you shall see greater abominations than these. And he brought me into the inner court of Yahweh’s house, and, behold, at the door of the temple of Yahweh, between the porch and the altar, were about five and twenty men, with their backs toward the temple of Yahweh, and their faces toward the east; and they worshipped the sun toward the east. Then he said unto me, Have you seen this, O son of man? Is it a light thing to the house of Judah that they commit the abominations which they commit here? for they have filled the land with violence, and have returned to provoke me to anger: and, lo, they put the branch to their nose. Therefore will I also deal in fury: mine eye shall not spare, neither will I have pity: and though they cry in mine ears with a loud voice, yet will I not hear them” (Ezek. 8:15-18). Passover is the only legitimate and commanded observance in honor of our Savior’s death. He kept it with His disciples just before He was impaled, and He said He would observe it again in the coming Kingdom. What better certification for an observance can we get? No Scriptural mandate exists for an annual observance of His resurrection. Let alone the idea of a Scriptual Easter. Yahweh will one day teach man­kind that He is the only true Mighty One. All will learn—through pain of plague, if necessary—that pagan abominations will not be tolerated. And man will one day discover what True Worship is all about and what blessings can be his if he will simply be obedient not to traditions of the world—but to the Word.